What's better than doing your workout routine in your crappy, dank apartment? Oh, I dunno, how about doing your workout routine in a villa on the beach? Or on top of a beautiful hillside? Or what the hell why not, in the middle of a black hole? Well, that day is coming, and Runastic of Oculus VR is a sneak peek. 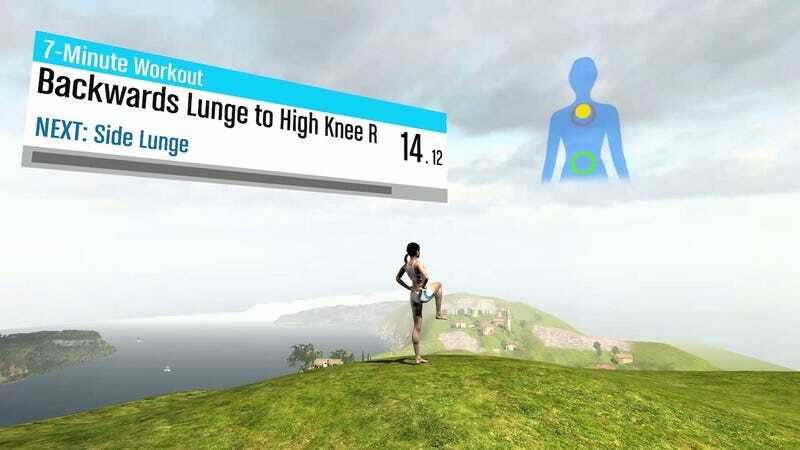 Built as a proof on concept, Runtastic for Oculus is essentially a port of some of the company's other fitness apps, like the 7-Minute Workout, but there's also lunges and squats and supposedly more workouts (like yoga) or in the pipeline. Inside the virtual world you follow along with a virtual trainer (make sure you're in a clear space at home, people), and your stats are displayed in a magical panel floating above you. You use a 3D motion tracking camera (possibly a Kinect) and reps are automatically counted for you. It doesn't look like it's set up to do anything super advanced like check your form (which some Xbox One workout apps can do), but it might be a fun way to add a little spice to your workouts.